Now, if you’re a conservative, the content of this tweet is beside the point: You hate Bill Clinton, but you really hate Hillary Clinton, and Chelsea Clinton, in your mind, is a Mini-Hillary. Just reply with a Breitbart meme about global banking and be on your way. If you’re a member of the so-called “dirtbag left,” however — a coalition of unapologetic socialists who mock centrist Democrats as well as the alt-right and establishment Republicans — you abhor this tweet for a totally different reason: With an education that included Stanford, Oxford, Columbia and NYU, Chelsea should know what “the banality of evil” actually means, yet cannot effectively explain why she dropped the phrase here. Hi Frank – it's a reference to Hannah Arendt's Eichmann in Jerusalem. What happened in Phoenix is horrifying. Grateful no one was injured. Hi David – was a response to an earlier tweet. I'm very grateful & lucky to have had terrific teachers from pre-school through grad school. The article Chelsea linked to concerns the arson of an LGBT youth center in Phoenix. The suspect is a man who had availed himself of the organization’s services until he aged out of the program in 2016. It’s a sad story, but what does it have to do with the 1961 trial of Nazi officer Adolf Eichmann for crimes against humanity, as reported in Eichmann in Jerusalem? Arendt’s argument — misunderstood more often than not — is that Eichmann was a stupid careerist, helping to engineer the Holocaust in the shockingly ordinary (or banal) hopes of continued promotions. While we don’t yet know the motivations of the Phoenix arsonist, it’s safe to say they had little to do with getting ahead at work. The report is less suggestive of evil than mental illness. Arendt writes of normalized violence as part of a political machine, not lone acts of terror. That Clinton would cite this already controversial theory as a slogan or cliché where it has no application irks the left because it speaks to one of their great hobbyhorses: neoliberal disconnection. Not only is Chelsea Clinton a lifetime one-percenter far out of touch with the middle and working classes, but she can’t even grasp a freshman-level historical text that ought to fall squarely in her wheelhouse. No wonder they keep begging her not to run for office. One poll found that about half of registered voters (including 48 percent of independents) don’t want to see her launch a campaign in the coming years. Yet the insults came from the other side, too — Saturday Night Live made fun of her looks in a “Wayne’s World” sketch when she was still an awkward 13-year-old. It’s baffling that she came in for so much ridicule; the Obama girls were generally fawned over on social media, and the hard-partying Bush twins were seen as reality-TV-style entertainment. 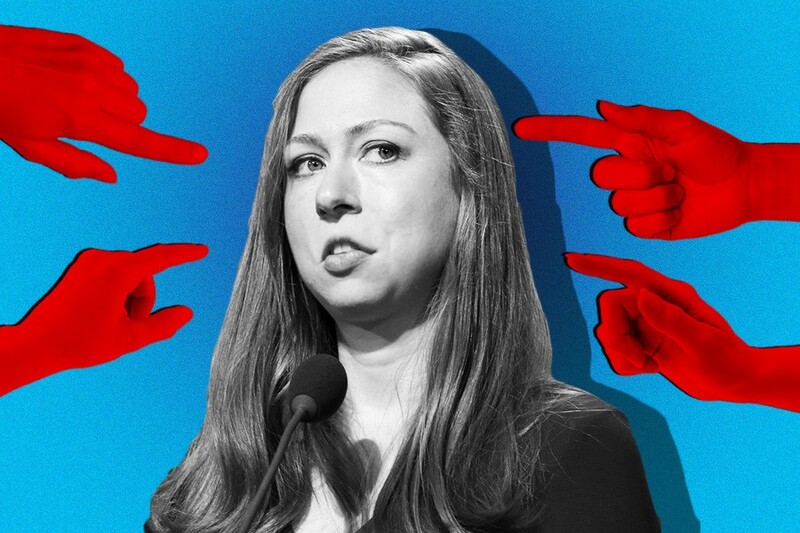 Whatever confluence of factors made Chelsea a punching bag as a kid (misogyny, resentment, her seeming averageness) has now come full circle, with a varied swath of Americans allied against her public influence or dynastic prospects. It was hilarious to see Trump, under fire for letting Ivanka conduct state business, argue that Chelsea would be applauded for taking a role in her mother’s hypothetical administration. Obviously he’d be the first to scream about it, with Chelsea then savaged by the press and Twitter in ways that Ivanka, a public relations android forever appearing in some fluff profile or other, has never dreamed of. There’s simply no comparison. Of course, Chelsea doesn’t need our protection or help. She’s a 37-year-old woman of means and advantages, and she’s free to keep reminding us of the private schools she attended instead of engaging with the people who try to correct her read on a mid-century book that dissects the totalitarian mind. But as long as she does, she’ll never be seen as likable, relatable or even a cogent thinker. Couldn’t she have shared that article without being so glib, seeing as the crime is yet unexplained? Couldn’t she have noticed that the director of the LGBT center herself said there was no reason to suspect the arson was a hate crime, and therefore not tried to extrapolate a wider trend in this cryptic, confusing way? What in the hell was that tweet meant to convey or accomplish? Maybe it was never fair to expect more from Chelsea. In a different universe, she has a few hundred followers, and none of what she says online really matters. But in this reality, between the naked ignorance of the adult Trump children and the flawed progressivism her parents have come to represent, she can’t win until she somehow rises above both.